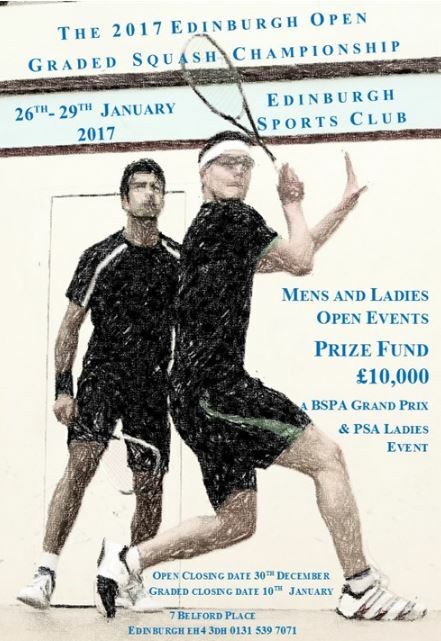 The Edinburgh Sports Club Open 2017 is the biggest tournament on the BSPA calendar and the biggest annual squash event in Scotland. The Men’s draw is headed by world number 15 Daryl Selby who will be aiming to win it for the 6th time. Scotland’s number 1 Alan Clyne, world ranked 34 will be looking to retain the title he took from Selby in a sell-out final last year, but he must first take out world number 35 Adrian Waller who he is seeded to meet in the semi-final. Local interest sees ESC players Dougie Kempsell (world ranked 112) seeded 5/8 and Rory Stewart (recently crowned British Open U23 Champion) looking to take some scalps and progress to the latter stages, whilst Kevin Moran, Chris Leiper and Jamie Henderson will also be competing ensuring a strong Scottish turnout. The Ladies WSA draw is headed by Germany’s Sina Wall (WR 69). Seeded to meet her in the final is Alison Thomson (WR 70). Scotland’s number 1 player Lisa Aitken makes her return to the PSA circuit following injury and gets the wild card entry. Formerly ranked 30th in the world, Lisa has a realistic chance of taking the title. ESC talent Georgia Adderley and Carrie Hallam will also be in action along with Elspeth Young and Claire Gadsby ensuring a full scottish international turn out. The graded event which runs alongside the open will see 100 competitors from all over the UK rubbing shoulders with the top professionals. Making the championships a very special event. “Since its inaugural event in 2001 the championship has become a firm fixture on the international squash calendar and the strength of the draw continues to amaze me. It is rare to have squash of this level on our doorstep and anyone with an interest of the game really should think about coming along to have a look. It is also a great chance to see how our top players fare against those at the top of the world game.” Simon Boughton – Tournament Director. 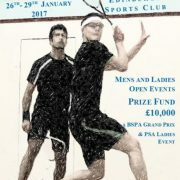 Jonathan Tait, Club Manager at Edinburgh Sports Club, is delighted with this year’s entry: “This event continues to attract some of the world’s highest ranked professional players to give spectators a wonderful opportunity to watch squash of the highest quality being played over a four-day period”. The Championships begin on Thursday 26th January, concluding with the finals on Sunday 29th January.